A dreaded question for any PhD student (in my field at least) is a non-specialist (often family or friend) asking something like… “so what is it you actually do?”. Maybe I’ll develop a stock response over the next year or two but for now there’s just lots of umming and ahhing until the subject is changed. I suspect a lot of PhD students feel the same way, hence the uptake of the #UpGoerFive hashtag where, in deference to a great xkcd, people have taken on the challenge of explaining complex topics using just the 1000 most commonly used words, through this great tool. Cue a tumblr and the usual twitter back-patting, but while it’ll no doubt be forgotten in a week or so, I really like this idea. I use computers to look at things on top of the stuff that tells a cell how it is made. Maybe the on top stuff tells the bottom stuff what to do, or maybe it’s the other way round. We don’t know that much about these things yet but we’re trying our best. I’m also seeing how the under stuff looks in real life – we sometimes like to think it’s a straight line but it’s really much prettier than that! Pretty tricky when words like “DNA” and “gene” are off limits, let alone anything to do with chromatin and histone modifications, but a great idea and maybe it’ll help me put together some kind of layman’s explanation next time I’m asked to explain my work in simple terms. 1) Begin learning a functional programming language (Clojure, Haskell, ML, OCaml or other) — I’m really interested in functional programming for several reasons, some more sensible than others. Nowadays I spend a lot of time using R and the functional aspects are powerful and intuitive for mathematical programming, so a deeper understanding of the FP paradigm will likely improve my grasp of R. More importantly I expect FP to become more important as parallelisation becomes evermore vital in ‘big data’ computational biology. Also, as a purely academic exercise, I think lambda calculus frames an aesthetically pleasing syntax and fosters interesting programming approaches. Lastly (and perhaps least importantly) I think it could be a quirky and interesting addition to my CV, as well as making me a more “well-rounded” programmer — for all that’s worth. 2) Develop my informal science writing — While regular blogging is on the backburner for now, I still think it’s important to practice writing about science for a general audience. One way of doing this is through competitions, such as that recently run by Europe PubMed Central, which I always seem to bookmark but not get around to entering. So note to self: follow up with these this year. 4) There’s more to life than a PhD — keep this in mind. 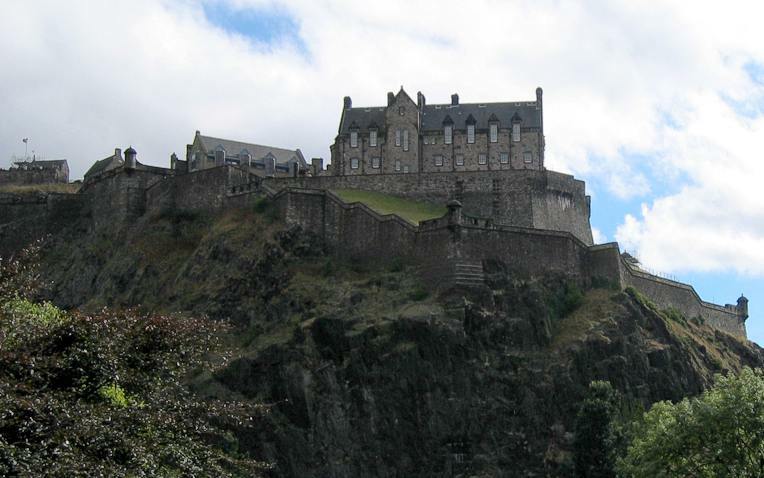 Edinburgh castle – awesome picturesque scene a lot closer to the city centre than you might think. The BBC has impressed me recently with a couple of standout science-related programs that haven’t shied from some traditionally dry subject material. Two weeks ago there was The Hidden Life of the Cell — a grandiose, narrative-driven tale of the epic struggle between the human immune system and viral invaders. It showcased some really impressive visualisations of molecular biology, as well as some interesting insight from scientists like Nick Lane* of UCL and narration by none other than Doctor Who himself! @BBCScienceClub great show very brave to cover genetics first. #DrTaliSharot helping me to understand #epigenetics – amazing! Both of these shows are nice departures from those that typically fill the “Science & Nature” category of iPlayer — namely Countryfile and AutumnWatch — and I’d like to think they reflect a growing interest of the populous in learning real science. While I do have criticisms of both the shows I mention here, kudos to the BBC for putting out these programs (especially at primetime) and I look forward to more quality science programming. * Good scientist, gaudy website! The Oxbridge application deadline for 2013 entry is tomorrow (!) and aspirational students can soon begin the long wait to find out if they’ll be attending the UK’s most prestigious institutions. But according to UCAS application data from 2011, Oxford and Cambridge combined received less applicants than the University of Greenwich, and this is despite a difference of around 100 places in one of the UK league tables. Greenwich even got more applicants per place, approximately 7:1 compared with Cambridge’s 5:1 and Oxford’s 6:1. So, overall the UoG must be more popular and more selective than these world-renowned institutions, should we now be referring to Oxbridgewich? He justifies the latter argument by referring to expected strengths or weaknesses of the different table methods, implying if you’re interested in x, then you want table y. I wasn’t completely convinced by this, and browsing the existing tables shows remarkable year-on-year fluctuations: The above distributions show the changes in rank from 2012 to 2013 in over a hundred UK universities. The highest of these jumps was a rise of 38 places (from 82→44 for Brunel University in the Guardian’s table)—in a single year! Other big leaps include a fall of 29 places for Leeds Trinity University College, and a 30 rank rise for Birmingham City (both from the Guardian’s table). These aren’t small universities either, BCU took on over 5,000 new undergraduates in 2011. Further there’s no significant change in the analytics that produced the rankings (for the Guardian: “The methodology employed in the tables has generally remained very constant since 2008” [doc]). So how could academic standards, quality of research, job prospects or any other considered metric vary so widely in 12 months at these universities? Are the student surveys that fickle? 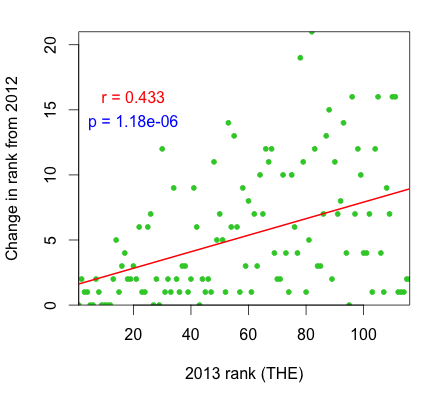 In a related vein, I wanted to look at the correlation of university rankings across different tables but discovered it has already been done in some detail by Sawyer, K. et al. (2012) in “Measuring the unmeasurable” (also the inconsistent naming amongst tables is probably too big an ask for my regex abilities). 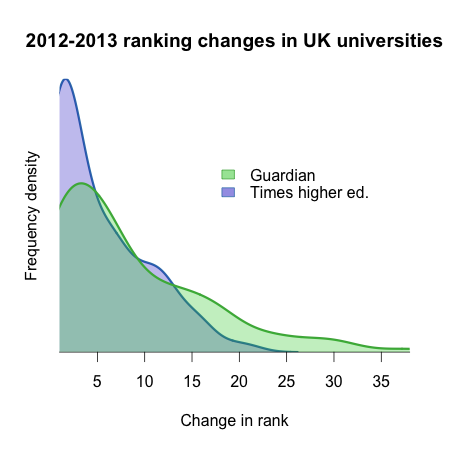 The authors found that while high-ranking institutions were well-correlated, those lower down the tables were not. They go on to analogise with financial markets and make somewhat fluffy generalisations about the validity of inference… but nevertheless the correlation analysis seems valid. To see if this differential treatment of lower-ranked institutions held in the 2012-13 change data, I did a simple linear regression analysis: As you can see, while the regression line itself looks an unconvincing fit, it had a significantly non-zero coefficient (0.064 ± 0.012, p = 1.18 ×10-6). The amount of variance explained by this trend would be a not-uninteresting 19%, so it does generally seem more unstable down there, or at least it is in this snapshot of the THE table. As evidence in favour of the usefulness of tables, a principal components analysis, again using world rankings [pdf], concluded that the variable with the highest explanatory power was indeed academic performance (R2 = 0.48), though this study didn’t stratify high and low-ranking educational bodies. In light of the above result, it seems likely that a subset of lower-ranked universities may have a different principle component. Overall I’m not making an argument against the use of these tables, I know I relied on them when picking out my UCAS choices, but it seems likely that while Oxbridge may have a gentlemanly back-and-forth over the top spots for years to come, the University of Greenwich and its ilk will probably be flying all over the place, and proclamations of ‘this year’s most improved rank’ (e.g. , , ) should be viewed with particular scepticism. Having just edged up to (an admittedly meagre) 100 followers on twitter, and as I’ve just started my PhD, now seems a good time to finally start a blog. The hope is that by writing about my research and other (un)related topics, I’ll have a lasting record of what I’ve been up to which might even interest some wandering internet folk. At worst it should help improve my informal writing. Expected topics include: recent advances in computational biology, particularly regarding higher-order chromatin and gene regulation; programming bits and pieces, focusing on R and Python; life as a PhD student; maybe even whimsical tales of life in Edinburgh—who knows!